After we had a break at the cafe in front of Kawaramachi station, we went to Takamatsu station and took a walk and then we went to the bus stop in front of Takamatsu station. I don’t have driver’s license, and he seldom drives. 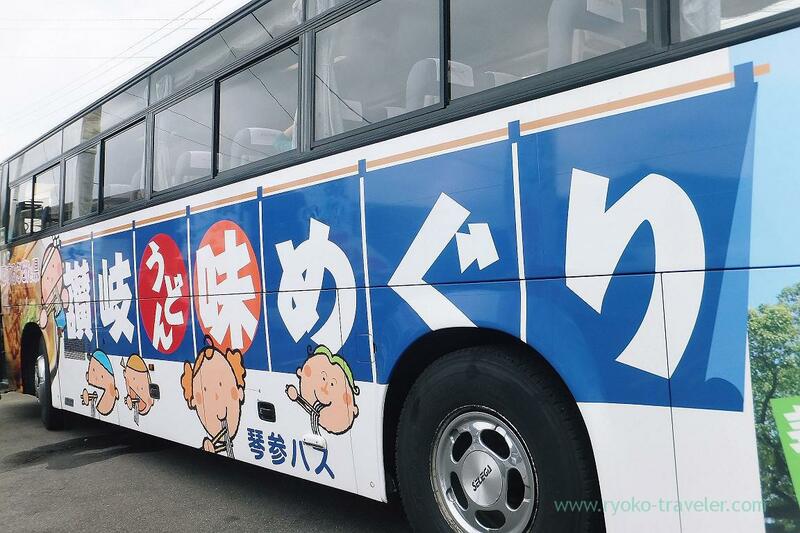 So, we decided to take part in the udon tour that is managed by Kotosan bus. 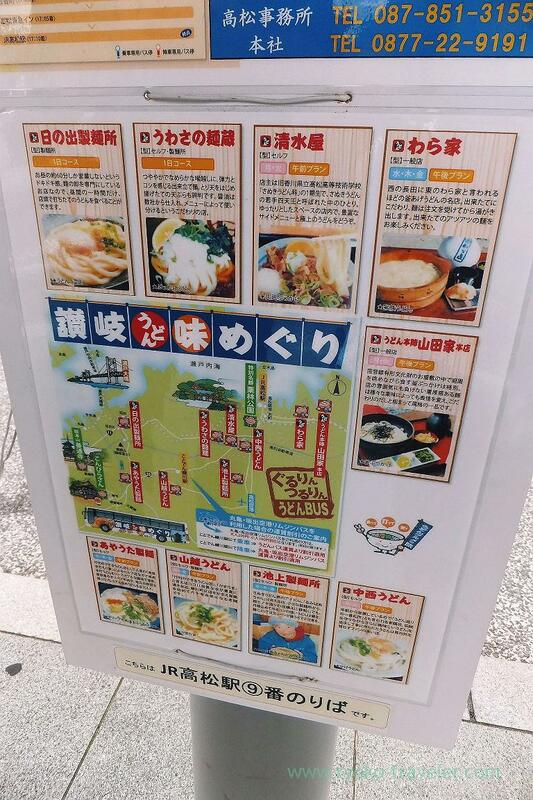 We could visit two udon shops and Ritsurin park within half in a day. Name card. We were required to have it during the tour. I usually get heavy car sickness, expecially in bus and taxi. 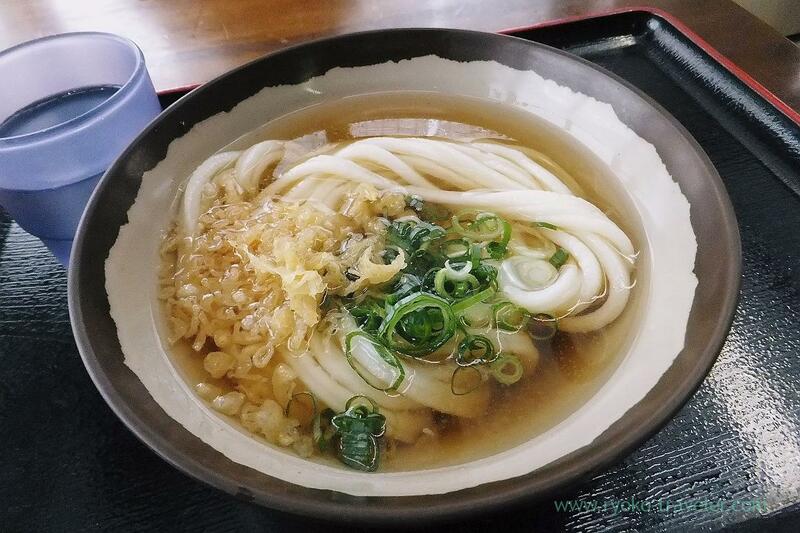 At first, our tour bus carried us to Ikegami Seimensho that is great famous udon shop for “Rumi baachan”. 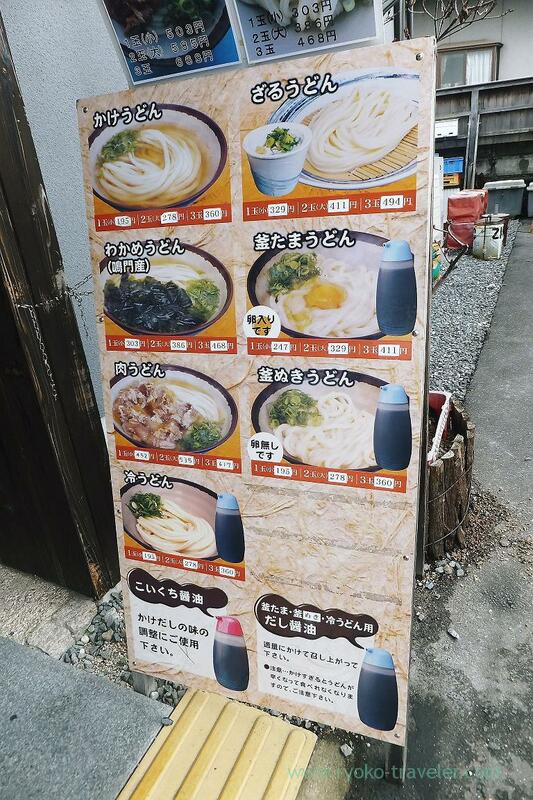 Rumi baachan is elder lady who had started to this udon shop when she was younger. Her udon has been loved by great number of people. Her udon shop was closer to the station than now. 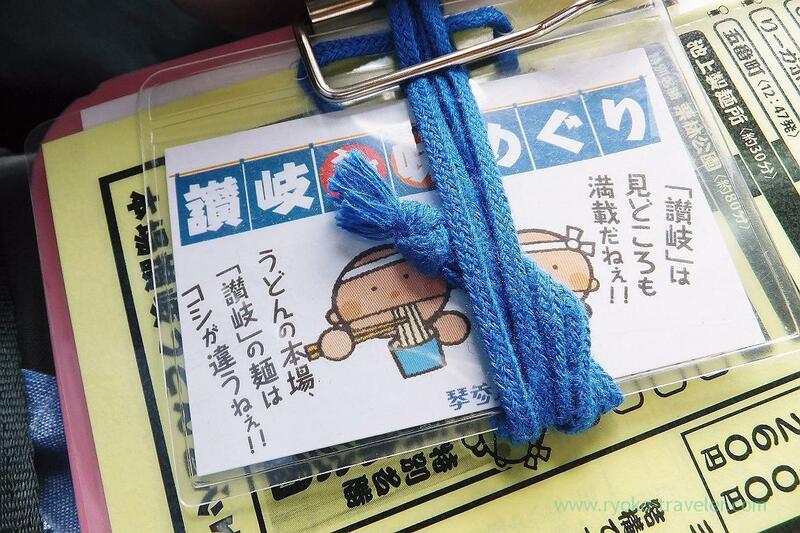 But they had to move to this rural area because the shop had became extremely popular shop. After 20 minutes or so, we got to the shop. Menus. 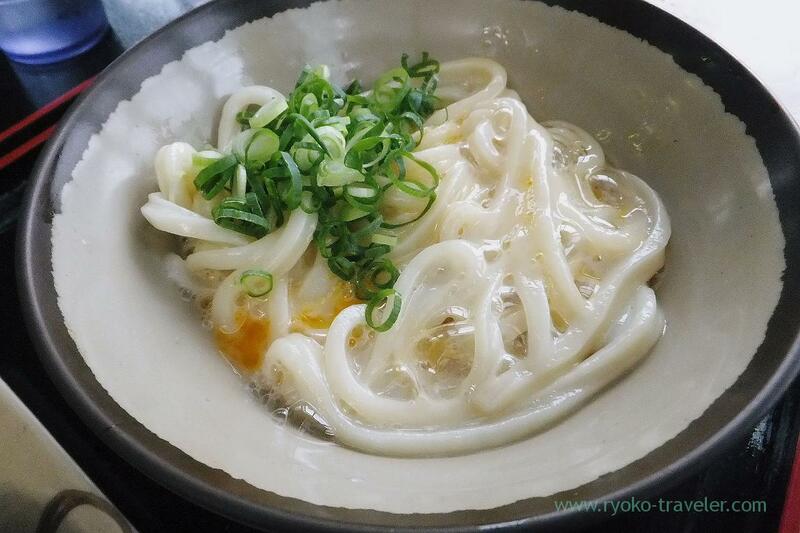 Kamatama udon is the most popular udon of Ikegami Seimenjo. 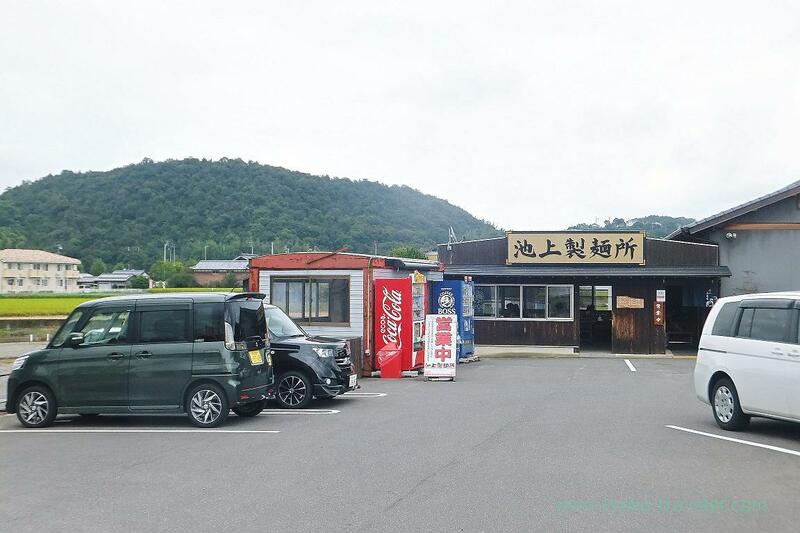 It is not too much to say that kamatama udon became popular way of eating udon thanks to this shop. Order counter is right. 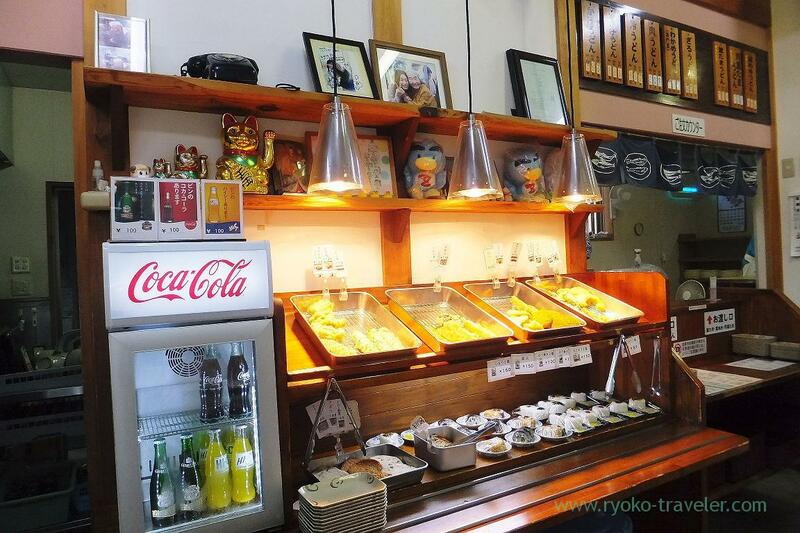 After we order and get our udon, we pick tempura, onigiri and juice as we like. After that we pay for the foods on our tray. And then we go to eating area and eat. Oh, photos of Rumi-baachan is above the shelf 🙂 She has already been retired from cook, but she sit down besides souvenir area. I had wanted to eat Kamatama udon, but, well, as you expect, I was suffering from the carsick. But fortunately I didn’t lose my appetite at all. So, I ordered Small kake udon (かけうどん 小, 195 yen). Kake udon have refreshing taste. So that’s good for me that time. The flying fish soup (called agodashi) was flavory and bitter just a little. And springy udon. It was delicious. I ate it up with easily. 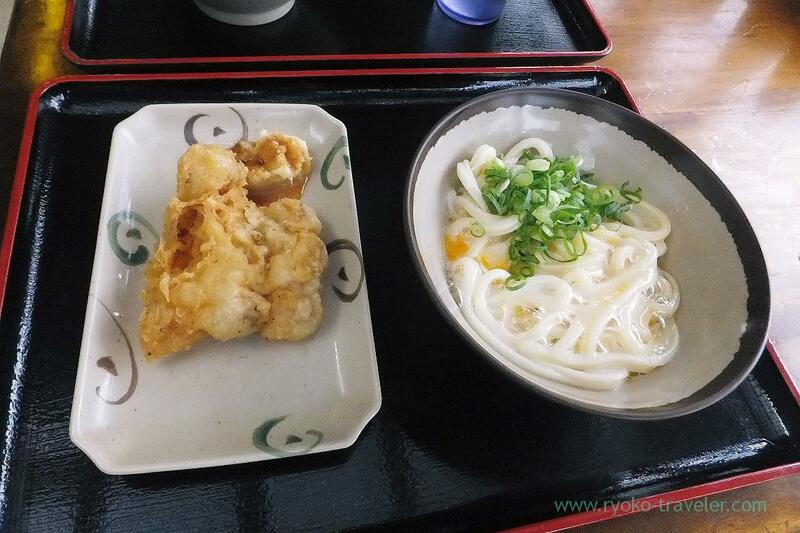 He ordered Small kamatama udon (釜たまうどん 小, 247 yen) and chicken tempura (鶏天, 130 yen). I tasted it just a little. But unfortunately, I hated the smell of raw egg nevertheless raw egg is my delight ! I hate carsick ! By the way, Ikegami Seimenjo sell udon on the internet. They also sell at the shop. Of course, I already got it by Rakuten many years ago. But I think eating the udon at the shop is the best way to taste their udon if you have a chance to visit there. How do I book the bus? There’s an application form on the official website. But the website for the tour is in Japanese only.